We keep thousands of data points about the park, from the number of chairs we have to the number of guests we entertain during the day. Every week, we share a new data point in our e-newsletter, MidCity News, in a section called "Bottom Line." Here is a selection of some of our recent Bottom Lines. 23.12. 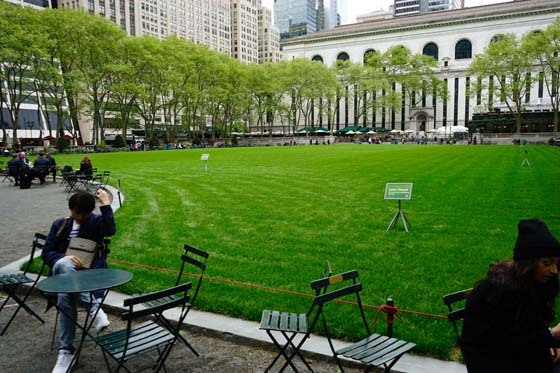 A recent "Stat of the Week" in Commercial Observer states that asking rents around Bryant Park command a $23.12 premium per square foot over the Midtown average. Cumbia drew quite the crowd. Photo by Angelito Jusay Photography. 4. 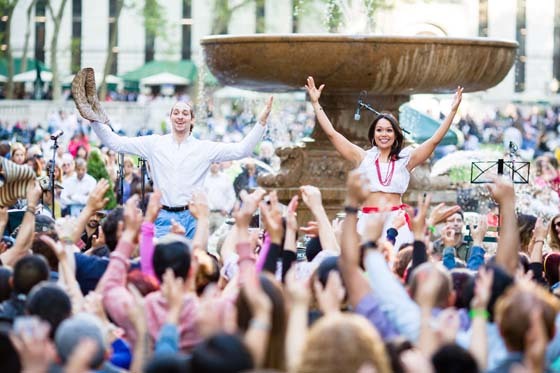 Midtown music lovers have a lot to choose from this summer as 34th Street Partnership presents four live music series. Download the 2016 events brochure to make sure you don’t miss a performance. 54. With the recent addition of real “gamer” favorites like Forbidden Island, Shadows Over Camelot, Carcassonne, Wits & Wagers, and King of Tokyo, Bryant Park Games now offers 54 tabletop games for use free of charge. 5,775. Park Manager Brian Schliessman directed the installation of the park’s lawn, during which crews laid down 5,775 pieces of sod measuring 2 by 4 feet each. The lawn takes a rest before its big debut. 3,222. In 2015, players at The Tables went through 3,222 ping pong balls. The Tables, as well as our other activity areas, are open daily from 11am to 8pm. 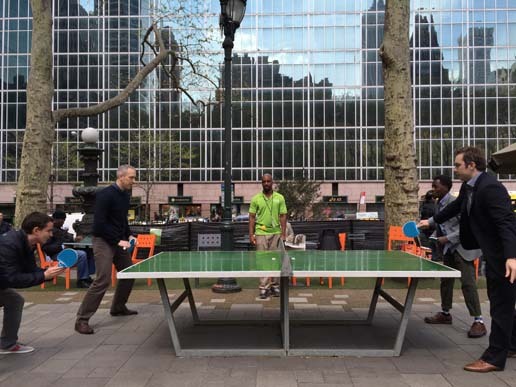 While not required, wearing suits makes ping pong all the more challenging. 116. This winter, 116 chilly park visitors took home a free scarf created by participants at Bryant Park Knits. Directed by the pros at Knitty City, "Found But Not Lost" made the scarves available at various spots throughout the park.